OverThe last few weeks we featured a number of state-of-the-art sequences, mixers and amplifiers here on Geeky Gadgets in the run-up to the NAMM show. Many of which included a dock for Apple’s iPad tablet, enabling you to do an array of different things with your musical instruments and audio. Looking to bring a more physical edge to sequencing rather than using the touchscreen. 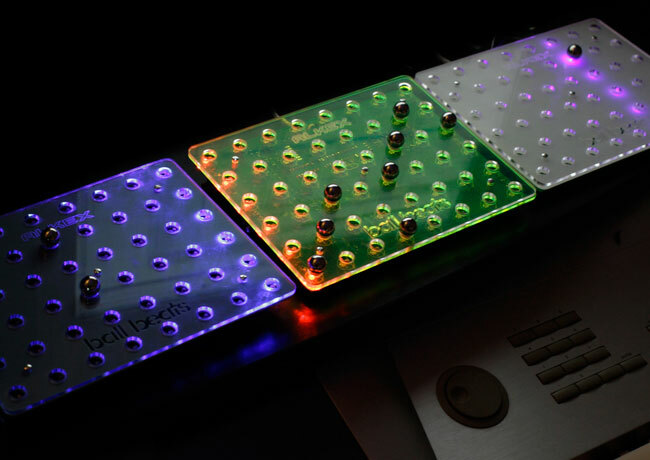 A new sequencer called “Ball Beats” has been created that uses steel ball bearings to create and compose beats. The Ball Beats sequencer has been designed to be used with either Mac Linux or PC computers and provides a more original way to create beats. Watch it in action in the videos after the jump to see how it works. The Ball Beats sequencer if a simple looking acrylic sheet with holes cut into it. Once a ball bearing is place into one, a note is then played within the sequence. Users are able to set the loop in the opposite direction, ping pong style and you can also set the note duration and shuffle the steps by activating random modes if required. The Ball Beats sequencer measures 6 x 8 x 1″ inches and comes supplied with 50 steel ball bearings. Its also fitted with a 8 step sequencer, 6 multimode channels, built in USB i/o interface and sync to midi timecode. For more information and to purchase a Ball beats sequencer for $199 jump over to the Alkex website.